Hamilton needed only to finish seventh at Sunday’s Mexican Grand Prix to become champion, even if Ferrari’s Sebastian Vettel had won – but the German could manage only second place behind the dominant Max Verstappen, despite a valiant and strong race. 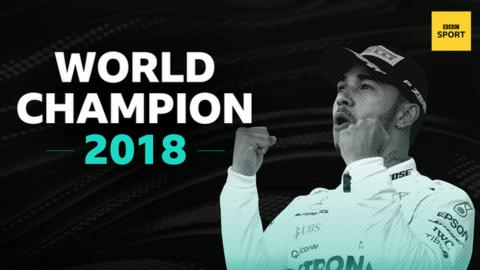 It was a difficult race for the Mercedes driver, who battled tyre problems throughout, but his finishing position just off the podium, in fourth, was more than enough to seal the biggest achievement of an illustrious career. At the end of the race, Hamilton pushed his car through a series of celebratory ‘doughnut’ spins in the track’s stadium section, before waving to the capacity 135,000 crowd. Vettel broke off from his post-race interview to congratulate Hamilton, as the two men embraced at the conclusion of a titanic battle. The race was a reminder of what might have been for Vettel, as both Hamilton and Mercedes team-mate Valtteri Bottas fell back with excessive tyre wear and his Ferrari moved up with an aggressive strategy to pressure the Red Bulls in the closing laps. But it was too little too late for Vettel, whose season, once so promising, unravelled in the summer and early autumn with a series of errors from driver and team. Hamilton and Mercedes were well below the high standards they set for themselves as they won six out of seven races from the German Grand Prix in late July to the Japanese race in early October. But that run – and the consistent excellence that both pressured Vettel and Ferrari into their mistakes and won races through the highest quality driving and teamwork – had put Hamilton into a comfortable position. And it was enough to seal the championship despite such a relatively lacklustre race, perhaps their poorest in terms of absolute performance of the entire season. Hamilton had started the race with hopes of clinching the title with a win, and he did challenge for the lead on the run to the first corner. But Verstappen muscled him aside, as they left pole-sitter Daniel Ricciardo’s Red Bull behind following a poor start, and the Dutchman never looked back. Verstappen was in control throughout, soon easing away from Hamilton into a comfortable lead as the Mercedes driver began to struggle with tyres. Behind Verstappen, Hamilton never sounded comfortable, complaining soon after his first pit stop that the tyres he had been fitted with didn’t feel good. As the stint went on, he fell further and further back as Mercedes tried to persuade him to manage his tyres. Shortly after half-distance, Vettel, who started fourth, had passed Ricciardo for third and then took Hamilton on lap 39, with 32 to go. Hamilton continued to drop back and on lap 47 he locked a wheel under pressure from Ricciardo and ran wide at Turn One, then pleading with his team that his tyres were finished. He pitted for fresh ones and rejoined with 24 laps to go on a set of ultra-softs, and backed off to ensure he could get to the end without drama. As Hamilton was struggling, Vettel was beginning to think of a potential win. He made a second pit stop on lap 47, and when Verstappen stopped again himself a lap later, Vettel was four seconds behind Ricciardo, who was on old tyres, and five seconds behind his team-mate. Vettel was quickly on Ricciardo’s tail, but the Australian appeared to be capable of holding off the Ferrari to the end, until his car failed for the eighth time this season and he retired on lap 62, promoting Ferrari’s Kimi Raikkonen to the final podium position. Ricciardo’s retirement caused some nerves at Red Bull, and Verstappen was on the radio pleading with the team to turn down his engine to reduce risks of a failure as much as possible. But it held on for his second victory of the year in a race that, despite Verstappen’s impressive performance, was all about the man who finished fourth. Brazil in two weeks’ time. Red Bull are expected to slip back into a more normal level of competitiveness. But can Hamilton break his run of never winning another race after clinching the championship before the final event?